Performances of the London stage version of the Lord of the Rings have been suspended after a cast member was injured during the show. 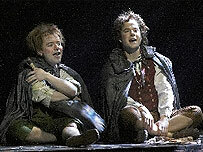 One of the actors is believed to have caught his leg in the moving stage during an early scene. The individual was not one of the lead actors, but the show was halted and the audience offered refunds. Performances are due to resume on Saturday. The £8m musical is currently previewing and officially opens on 19 June. The set involves a large hydraulic stage which can revolve, and be raised or lowered in sections. Audience member Tori Lowe said: "The hobbits were on stage and had a group of dancers dressed as rangers with them. "There was suddenly a lot of screaming, but at first we thought it might be part of the show. "But a stagehand came runnning on, and when the music stopped we could hear someone shouting 'My leg! My leg!'." In a statement, the producers said they were "looking at modifying the staging" so previews could resume. The three-hour production, at the Theatre Royal Drury Lane, has a cast of 50 actors and acrobats. It has undergone a major rewrite since closing just six months after its premiere in Toronto last year.